As is part of the adoption process, sometimes plans can change at the last minute, leaving adoptive families devastated. While everyone keeps in mind the rights and wishes of the birthmother and what is best for the baby, it is hard to comes to terms with your hopes and dreams being shattered. Hope is something that families looking to adopt develop the ability to master. The ability to optimistically will something to come to fruition that you have no control over. However, when the fruits don’t come to fruition, that ability to continue to hope can truly be tested. 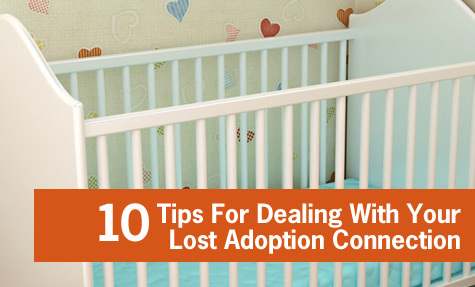 Here are ten tips for coping with your lost adoption connection. 1. Understand that everything does happen for a reason. 2. Take the lessons from the experience. It will no doubt make you will more, hope more, and want more. Make sure you channel that emotion in a positive way. Don’t dwell on the negative. 3. This is all part of your training to be parents. It is not always easy. 4. Grieve. You have just experienced real loss. Take it seriously and give yourselves the time necessary to grieve and heal so that you are ready to move forward when the time comes. 5. Have faith that your baby will be delivered to you at the perfect time. Keep preparing. Keep busy, and stay focused! 6. Surround yourself with positivity, including supportive people. Do things you enjoy. Listen to happy music to help yourself cheer up. 7. Be grateful. Give thanks for what you do have! 8. Support and give your energy and love to your partner to help recharge each other. You are stronger together and in this together! If you don’t have a partner, then take comfort in your friends and family. 9. Forgive. Let go of any hurt and anger you may be holding towards the birthmother’s decision. If you can, send her a letter wishing your best thoughts and love. 10. Believe, believe, and believe. Always hold onto your hope. Emma Mildon is an author and columnist who specializes in adoption, foster, orphans and inspiration. Yes…they are all linked and Emma writes about them all on her website.